Greater Amplification with Exceptional Speakers! PCS-4-V: Stage 2 systems are built around our tried and true CS Series amplifier design, formerly known as the PSC series. This linkable platform is a bullet proof solution for just about any application. Our recommended Stage 2 systems range from 2 - 4 speakers, but you can mix and match them at will. All provide clean, clear, loud results that are non-invasive and built specifically for your bike. Just as it says, all four speakers in your face. 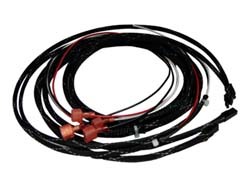 The Four in the Face system takes all 300 watts and puts it where it counts. 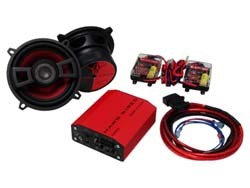 The included GBV525 kit converts your vented lower fairings into 5.25" speaker cabinets. Want even more? Add an additional set of speakers and amp to a Tour-Pak or speaker lids and turn it into a 6 or 8 speaker beast. Our CS series amplifiers are all linkable and 2 Ohm stable. 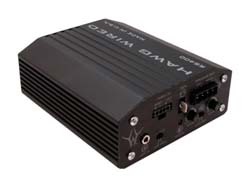 PCS-2-F: Stage 2 systems are built around our tried and true CS Series amplifier design, formerly known as the PSC series. This linkable platform is a bullet proof solution for just about any application. Our recommended Stage 2 systems range from 2 to 4 speakers, but you can mix and match them at will. All provide clean, clear, loud results that are non-invasive and built specifically for your bike. The Double Shot system offers the same great performance as always, but now powered by our best 300W amplifier yet. 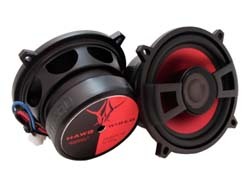 Crank it up with two DX series 5.25" component speakers now and add more later. The CS Series amplifiers are linkable and 2 ohm stable. CSK-300: Introducing our Competition Series, a new member of the RC-Link Family of products. Based on our original amplifier design, this new version is the smallest, most powerful one yet. 5 pounds of bang in a 1 pound bag just doesn't cut it. 150W of continuous power @ 4 ohms, and 300W @ 2 ohms; if that's not enough for in-your-face audio, we don't know what is. This new form factor allows you to fit 2 of these in a Batwing fairing (FLHT), and 4 in a Sharknose (FLTR). You won't find anything else like these amplifiers anywhere on the planet. CSK-400: Introducing our new Reference Series, a new addition to the RC-Link Family of products. Based on our original amplifier designs, this new version is the smallest, most powerful one yet. 5 pounds of bang in a 1 pound bag just doesn't cut it. 200W of continuous power @ 4 ohms, and 400W @ 2 ohms; if that's not enough for in-your-face audio, we don't know what is. This new form factor allows you to fit 2 of these in a Batwing fairing (FLHT/X), and 4 in a Sharknose (FLTR). You won't find anything else like these amplifiers anywhere on the planet. GBS-05: Convert those glove boxes in your lower fairing into speaker cabinets with these adapter brackets. No longer do you need rear speakers pods on a Tour-pak to run 4 speakers. Steel speaker brackets mount using existing holes. Black powder-coated grill provides a flush and clean look. Easy installation. Fits all MY '05 to '13 glove boxes for vented fairing lowers. Use with CX504 series Speakers only. 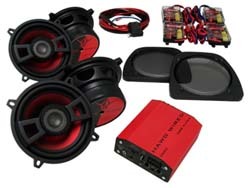 Kit includes: speaker adatper brackets, speaker ring grills, installation hardware kit and installation instructinos. 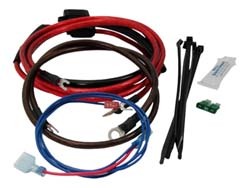 WH-400: This is all you need to install the Amplifiers. From the power and ground wiring to the zip ties needed to wrap everything up, it's all in here. WK-100: Use this kit when adding speakers to saddle bags, lids, or a Tour-Pak. Long enough to run from the front fairing to the back of the bike and has pre-installed 2 pin connectors per side, it's everything you need to get your new speakers up and running. DX-504: What's the next step to maximize your amplifiers output? Introducing the new DX Series. Based on our highly successful and proven CX Series design, these new DX Series raise the bar to a whole new level of performance. With 15% larger woofer cones, inverted cone support rings, and more clearance under the tweeter bridge, these bad boys can handle more bass and power than ever before. And with our new horned tweeters dishing out the highs, you're bound to get every ounce of power your system has to offer. No joke, the best 5.25" component speakers specifically designed for motorcycles just got better. ZX-654: When size matters or you're looking for the best we have to offer, look no further. 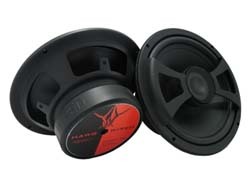 Our ZX Series 6.5" component speaker system is now available for all you true fanatics looking for even more. The ZX series feature a 160% larger cone compared to our reputable DX series, a tight knit 12db per octave crossover network, our signature bridge mounted component tweeter, and a set of proprietary conical adapter rings. All this sums up to one of our best speaker systems to date. Get ready to get loud!. This PN includes a pair of speakers only. It does not include fairing adapter rings. SG5252 Mesh Speaker Grills for Electra Glide: These steel mesh speaker grills as exact fit replacements or covers for your OEM cloth mesh. Not only can they let you show off your new speakers, but they allow the maximum amount of clarity to come through. These steel mesh speaker grills are black painted for durability and provide an excellent look at a low cost. Requires the OEM speaker mounting ring. These grills only replace/cover the OEM cloth mesh with steel mesh. RG5252 Steel Mesh Speaker Grills for Road Glide: These steel mesh speaker grills as exact fit replacements or covers for your OEM cloth mesh. Not only can they let you show off your new speakers, but they allow the maximum amount of clarity to come through. These steel mesh speaker grills are black painted for durability and provide an excellent look at a low cost. Requires the OEM speaker mounting ring. These grills only replace/cover the OEM cloth mesh with steel mesh. 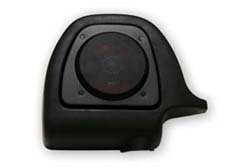 HD77047 Standard Speaker Grills for Electra Glide: If you have a Standard that came without a radio, or your current grills are not wedge style, you'll want to get two of these. Harley-Davidson's Speaker Grill for Standards. HD7702X Speaker Grills for Road Glide: This is the new style grill Harley installs on the 2004 & later models. We recommend upgrading your 2003 & earlier models. Harley-Davidson's Speaker Grill Kit for Road Glides.